← Who are the people who enjoy fresh farm food? Why is Buying Local Such a Big Deal? As we approach in this year’s holiday shopping season we are going to hear a lot of noise about the economy and fingers will be pointed and blame will be thrown. But I want you to consider how this all can change if we, each one of us, makes a change in the way we make purchases. This is completely apolitical, but it is involved and active. I remember in the 1960s that my parents, having lived through World War II, were dismayed as more and more manufactured products started being imported from Japan. They were not carrying grudges or being bigoted but were angry that American jobs were being lost in the name of bigger corporate profits. It’s only gotten worse. Through my own lifetime and yours we have seen factories close down and the owners move their processing to less expensive locations overseas. We are annoyed about not understanding the customer service rep’s foreign accent when we call an 800-number but we actually should be jealous at their ability to speak English so well. (I wish I was fluent in another language, even if I had a bad accent.) We should not be angry with that person; we should be really annoyed that the company we patronize is not hiring people here in the United States. We should consider why we patronize them. I remember as Wal-Mart started to spread across the country their big emphasis was on selling American made goods. Now you hardly ever see a product made in America sold there. Why? The profit margin on products made in developing countries is larger for that corporation. And we hear about how the low wages pay there mean a lot of their employees are enrolled in public programs for food or other assistance. Corporate greed has become so strong that a living wage is not even an ethical consideration. This is not a new issue. 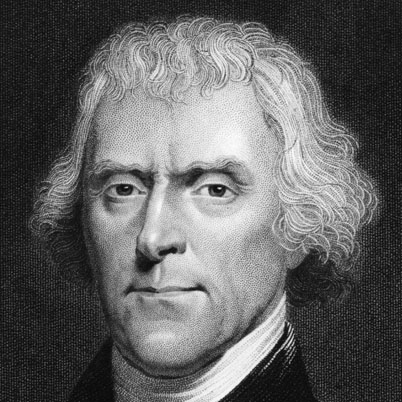 It is interesting to consider that Thomas Jefferson once said, “I have come to a resolution myself … never again to purchase any article of foreign manufacture which can be had of American make.” His actions were REVOLUTIONARY back in those days but perhaps it is time again to look at what each of us can do for our economy. Roger Simmermaker is the author of “How Americans Can Buy American: The Power of Consumer Patriotism.” He recently posted an article cautioning people that the foods that they purchase at farmers markets may not actually be local and may also not even be grown in the United States. As more and more people have begun to wake up to the local foods movement and using farmers markets as a resource, it becomes increasingly important that the managers of the markets verify that the people selling the produce and products ARE local farmers. Consumers should be able to know where the farms are located and the growing methods used. If you are a supplier at a local market, make a sign indicating where your farm is. If you are shopping at a farmers market, ask the sellers where they come from and how they raised their food. And if you see a watermelon in May, or strawberries in April, or corn in May…..you already know it is not local unless you are in California or Florida. Ask. And then, decide you can wait for when the produce is in season, and walk away. Instant gratification needs to end. We have to have a longer view now. Each of us have a role in helping your local and the national economy. Do you? This entry was posted in consumer demand, local economy, Local food, marketing and tagged local economy, Local Food, Thomas Jefferson, Walmart. Bookmark the permalink. 1 Response to Why is Buying Local Such a Big Deal? 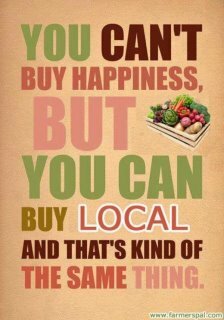 Thanks Beth, for this good reminder to us all to be neighborly by supporting our local economies.